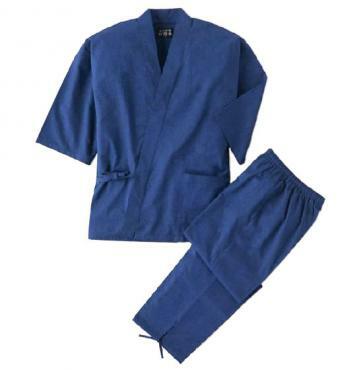 Samue, loose-fitting cotton kimono-style top and trouser sets, are top-quality traditional Japanese casual and leisure wear. This model is made by Watanosato in the city of Kurume, renowned for its high-quality fabrics and clothes. See below for detailed description. Samue, loose-fitting cotton kimono-style top and trouser sets, are top-quality traditional Japanese casual and leisure wear. 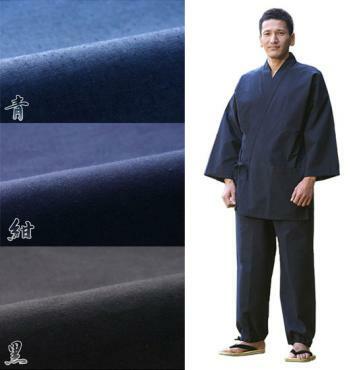 This model is made in the city of Kurume, renowned for its high-quality fabrics and clothes. Unlike cheaper brands that are made overseas and post-dyed, this samue is woven from the best hand-dyed cotton. The pants have pockets on both sides, an elasticated waist, with ties around the waist and ankles. The top has a pocket on the left side. The model in the photo is 179cm tall and wearing an X-Large size.